Fir is the common name for any of the evergreen trees comprising the genus Abies of the family Pinaceae, characterized by erect, cylindrical cones that shed their scales and by flattened, stemless, needle-like leaves growing directly from the branches. Fir also refers to the wood of these trees. Firs provide numerous ecological, commercial, and aesthetic values. Ecologically, they provide habitat and food for many animals, such as insect larva. For humans, they provide wood for pulp and for construction (plywood, crates, boxes, interior finishings) and their beauty and fragrance is a reason for their popularity in ornamental plantings and as Christmas trees. Some other similar trees that are not in the genus Abies, and thus not true firs, also have the common name of fir, such as the Douglas fir (Pseudotsuga menziesii), whose cones hang downward, unlike true firs (Nix 2006). True firs comprise the genus Abies, which includes between 45 and 55 diverse species of evergreen conifers in the family Pinaceae. All are trees, reaching heights of 10-80 meters (30-260 feet) tall, and trunk diameters of 0.5-4 meters (2-12 feet) when mature. Firs can be distinguished from other members of the pine family, Pinaceae, by their flat, needle-like leaves, which are attached to the twig by a base that resembles a small suction cup; and by erect, cylindrical cones, 5-25 centimeters (2-10 inches) long, that disintegrate at maturity to release the winged seeds, rather than dropping entire. The leaves usually leave a scar when they fall. 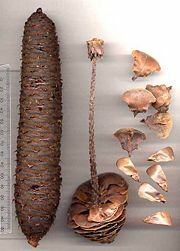 Identification of the species is based on the size and arrangement of the leaves, the size and shape of the cones, and whether the bract scales of the cones are long and exserted, or short and hidden inside the cone. Firs are most closely related to the cedars (Cedrus). Firs are found through much of North and Central America, Europe, Asia, and North Africa, occurring in mountains over most of the range. The wood of most firs generally is light and soft and often considered unsuitable for general timber use. However, it is often used as pulp or for the manufacture of plywood and rough timber, as well as construction of crates and boxes and for interior finishings. Canada balsam, also called Canada turpentine or balsam of fir, is a turpentine that is made from the resin of the balsam fir (Abies balsamea). Many firs are valued for their beauty and fragrance, whether as Christmas trees or ornamental trees. Nordmann Fir, Noble Fir, Fraser Fir, and Balsam Fir are very popular Christmas trees, with aromatic foliage that does not shed many needles on drying out. Nix (2006) provides a list of the most popular Christmas trees, with three firs prominent on the list: Fraser fir, Abies fraseri (most popular); Balsam fir, Abies balsamea (third); and white fir, Abies concolor (ninth). Many firs are decorative trees, notably Korean Fir and Fraser Fir, which produce brightly colored cones even when very young, still only 1-2 meters (3-6 feet) tall. Firs provide habitat and food for many animals, including the the larvae of some Lepidoptera species, including Chionodes abella (recorded on White Fir), Autumnal Moth, Conifer Swift (a pest of Balsam Fir), The Engrailed, Grey Pug, Mottled Umber, and Pine Beauty. Nix, S. 2006. Top ten Christmas tree species sold in North America. About.com. Retrieved September 16, 2007. Arboretum de Villardebelle cone photos: Images of cones of selected species. This page was last modified on 10 April 2017, at 18:08.